Frantz, Laura. The Mistress of Tall Acre. Grand Rapids, MI: Revell Publishing. 2015. 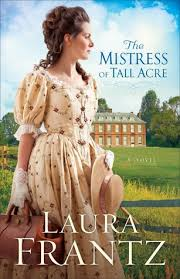 Drawn to the cover, title, description and author, The Mistress of Tall Acre was everything I knew it would be. I so enjoyed the story-line mingled with the characters, intensity, time-frame, romance and writing, even more than I anticipated. Earning a place on my top-shelf of excellent books, Laura Frantz has written yet another fantastic novel. Not ready for the book to end, I was so disappointed when it did. Living and writing in a log cabin in Kentucky, I can only hope Laura Frantz is busy on her next novel. This entry was posted in Christian Books and tagged Adventure, American Revolution, Christian, Christian Author, Christian Book Review, Christian Fiction, Christian Historical, Christian Romance, Inspirational, Laura Frantz, The Mistress of Tall Acre by Savurbks. Bookmark the permalink. It is a fantastic read! One of my favorites!! Have you read this author yet? I have not! I love the cover! As do I…the cover was what first caught my eye. If you have the chance, read it-I truly enjoyed it!